I asked Spooky and he told me he had no idea! I know that I had several (many) pajama days. I HATE the cold and have spent a good deal of time whining about that. But it is not much longer, Smurfette until the cold will be a memory. I saw forsythia just about to pop yesterday and there are lots of daffodils and those pink trees. Last week was busy, busy, busy but this week is much better. 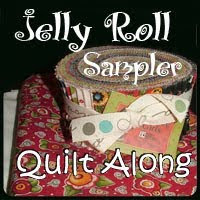 I am actually going to get the back and quilting done on one of the Just for You quilts. Then I need to find a backing for the monkey one. 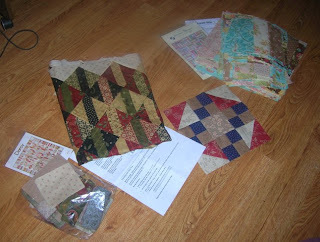 I am inspired by Laura quilting hers at the library the other day. And it will be time to turn them in before I know it. I guess I need to shed the pajamas now, and get going!!!! 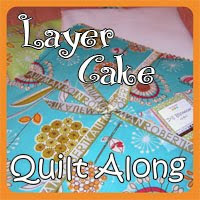 I think it is a morbid name for a quilt block. I am really getting nervous-this is another relatively easy block to construct. 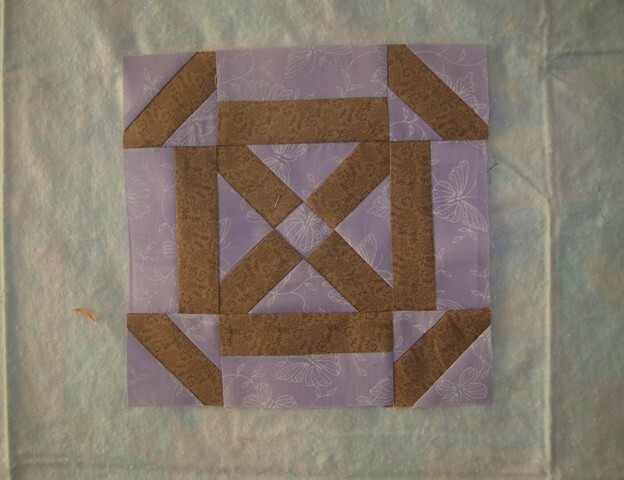 I decided I would use Bonnie Hunter's method of making the half square triangles and not use my most favorite magic wand! I used the Easy Angle tool and thus eliminated having to trim the blocks. Went for a food/fun and fabric trip today with Marty, Marie and Cindi. 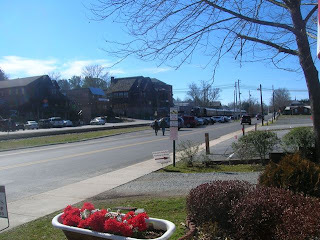 We checked out 2 fabric shops and had lunch at Grits in McDonough. Cute town square. And now I feel the need to recline for a bit! I am working on a braid quilt top that one can only describe as "happy". 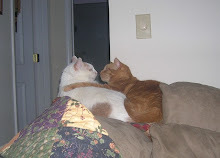 I just read Silver Thimble talk blog. I am glad that Pat is finally able to be vertical after quite a bout of illness. She has been one very sick cookie. At any rate, hopefully now she is on the mend. But back to her blog. She is doing a tutorial on her wonderful Snowbound quilt (that I won't be doing). I am one of her friends that is not over the rainbow in love with applique. My love is cutting up fabric into eighty gazillion pieces ala Bonnie Hunter. 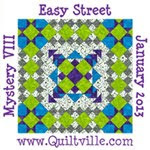 This month's Quiltmaker magazine has a 4 part mystery "Lazy Sunday Mystery". I have finished part one. 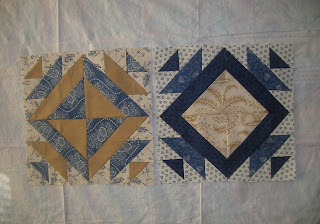 I am using some of the same fabric I used in Easy Street. It will be a companion to Easy Street. I won't be putting the happy little snowmen in this one. And reading today's blog by Pat... I need to get motivated and back to Comfort and Joy. I was on such a roll with it. I only have 4 applique sections to go. But C and J is buried under my pile of fabric for the above mystery. No excuse..next step won't be available until probably April. I am going to give myself a good talking to and jump back on the applique bus! 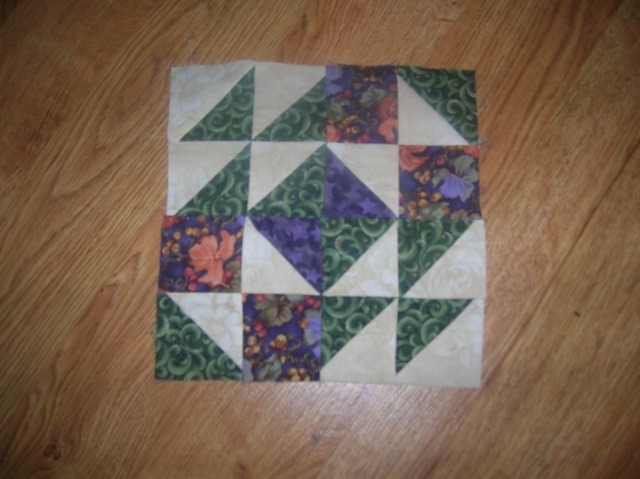 Block of the week is half done!!!! This is one of the easier blocks to complete. I really want to redo the parasol block from a few weeks ago. I am not happy about the way it came out (especially after I saw Kristie's and Sarah's). But then they are applique queens. While mine won't compare to theirs, I think I can make mine better than it is now. I still have not added the star on the Dixie Diary block. maybe today. It is quite cold today. 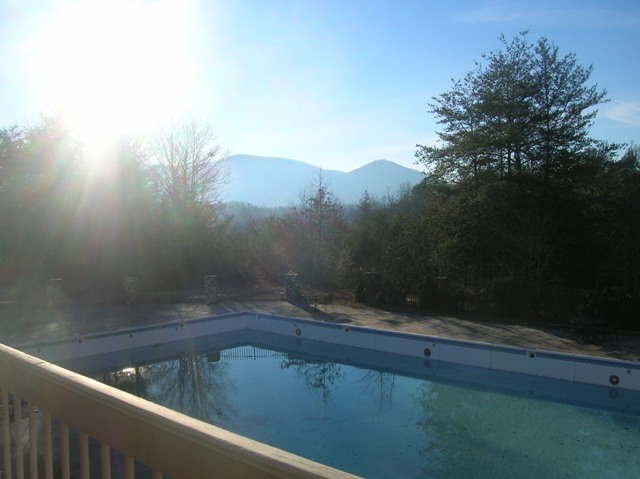 I am ready for it to warm up a bit. I keep thinking it is the middle of February, so it should not be much longer. 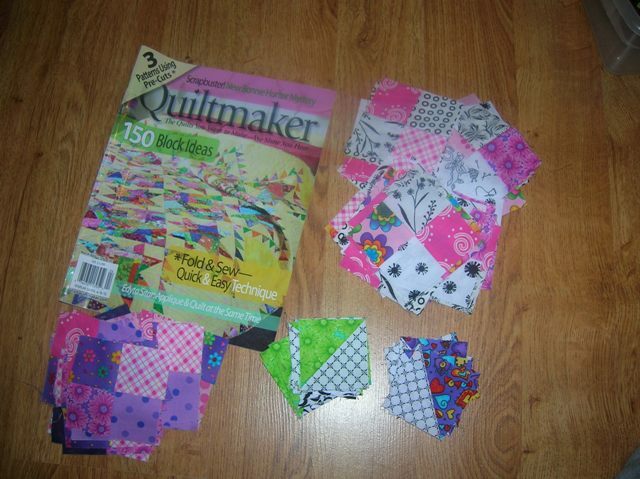 I must not have renewed my subscription to Quiltmaker magazine. I picked it up this week and there on page 52...Lazy Sunday Mystery by (tada) Ms Bonnie Hunter. And she is showing her fabric selection in colors similar to Easy Street (with some additions). Now the light bulb goes off- a companion to Easy Street. Besides my fabric is not yet put back Today I started at Thimbles making the four patches. I still have to make the half square triangles-248 of them. so far- 20 made! Like I needed another project!! 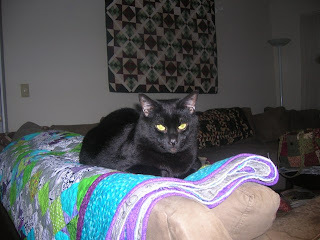 Spooky prefers newly finished quilts to roost on. 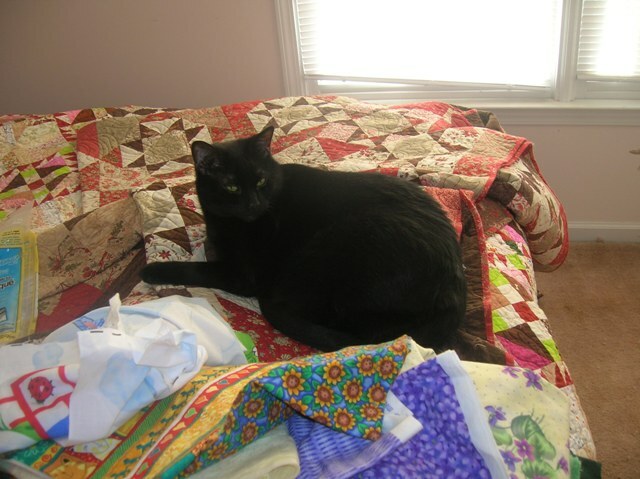 He is my official quilt inspector. He is highly indignant when I move it to work on the binding. He has given Easy Street 2 paws up. I bought this kit from Fat Quarter Shop about a year ago. I prepped the kit for summer Stitch-in last July. It came home in plastic bags. I learned a valuable lesson about precutting. Make notes on what you are doing and keep it with the kit. I really love this pattern. It is called Debonair and the fabric line is "Reenuzit Du". What's not to like about the French General? So project done!! (Except for a backing and binding). And then there is this.......Schnibble pattern called Darcy. I was able to partially complete this one. It has more work to do on it. I will take it to Thimbles this weekend and maybe get it done. Sarah completed her block of the week at retreat. I finished mine at home. #24 is True Blue-Too Smart. 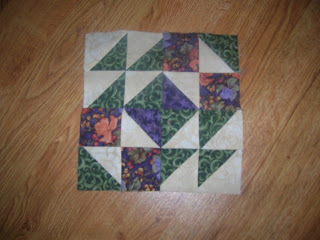 Easier than last week's block but I had to redo the half square triangles. Popsicle Sticks was another prepped for summer stitch-in. When I opened this one I did not have a clue what my plan was. I worked on it some and then pulled more fabric when I got home. This is another one that I will work on at Thimbles this weekend. (I sure am optimistic on sewing there). 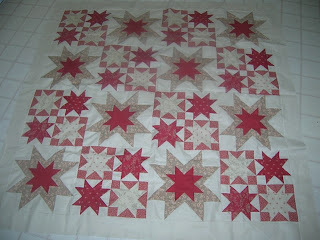 I still need to applique the star on the Civil War Diaries block of this month. White Path Lodge overlooking the pool-a little too cool for a dip! Look at that beautiful blue sky. The temperature was in the sixties. Meanwhile the Northeast was shoveling snow. This is why I live in Georgia! 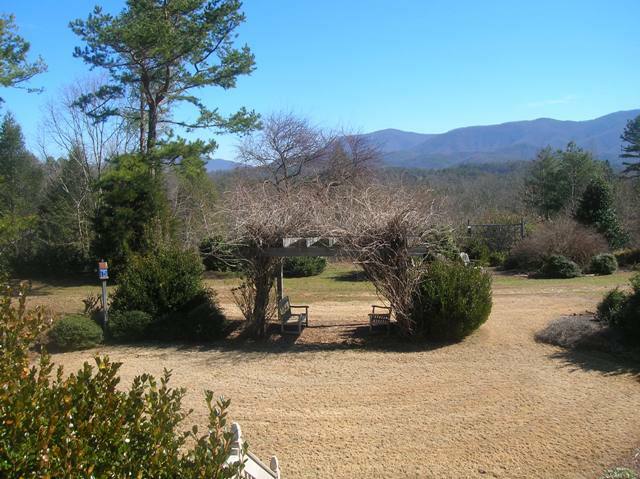 Beautiful downtown Blue Ridge. Train tracks go right thru the center of Main Street. The train travels between 2 towns-can't remember the other terminus. Close to Christmas, it is the Santa train. I just love the bathtub in the front yard of the quilt shop! I can't believe that the quilt retreat is already done and I am back home. It was so much fun. I did not get as much sewing done as I usually do because I had precut stuff from the summer stitch-in and could not remember what I was doing! Go figure. 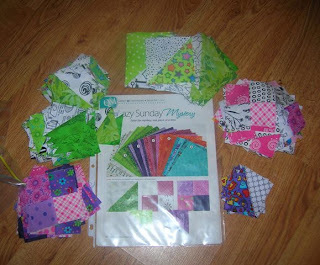 I did finish one top-a kit from Fat Quarter Shop using the "Renuzit" fabric. I must go ponder the retreat (on the couch) before I begin to put away all of the stuff piled up in the kitchen. That is as far as it made it from the car. Spooky has taken over the bed in the guest room. Probably because it has many quilts stacked one on top of another. Prince and the pea? It is the sunny bedroom and the warmest. He is no dummy! Block of the week-#22: Girl's Joy- An ounce of prevention. Not crazy about this block but it is done. I must say-Grandmother's Choice has good diagrams but you better know what you are doing! 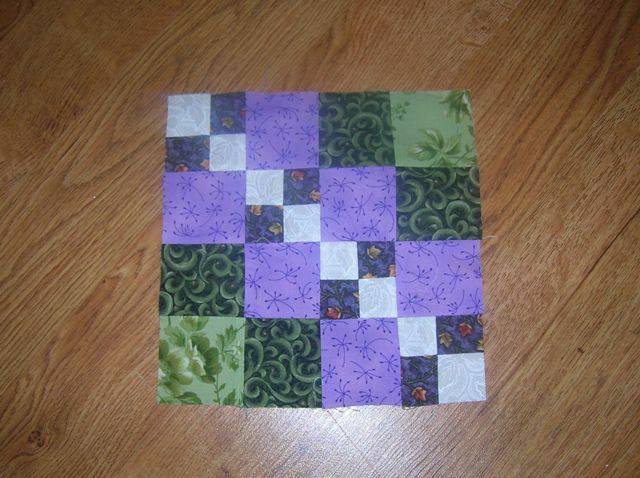 Blogger Girls block of the month for February is done.